Retired Brigadier General Robert E. Chapman, loving husband, devoted father, and CEO of Shalimar-based B3H Corporation passed away unexpectedly on May 29, 2002. 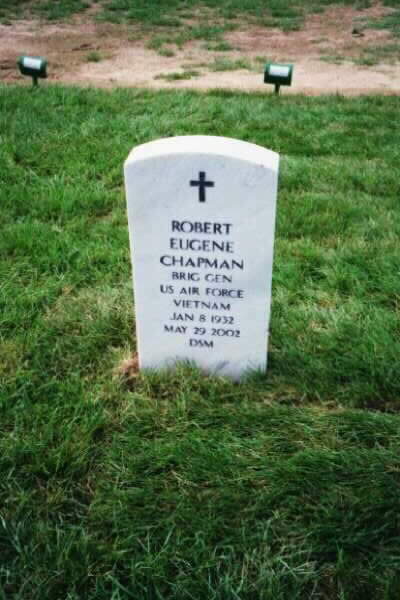 General Chapman was born in Russellville, Arkansas, in 1932. He graduated from the U.S. Military Academy, West Point, New York, in 1954. The general earned a master's degree in electrical engineering from the University of Michigan in 1962. He graduated from Air Command and Staff College in 1965 and the Air War College in 1972. The General was also a 1978 graduate of the Carnegie-Mellon University program for executives. His military decorations and awards included the Legion of Merit, Bronze Star Medal, Meritorious Service Medal and Air Force Commendation Medal. General Chapman began his distinguished military career in 1954. Following completion of pilot training and advanced flying school in January 1956, he then served as an F-86 pilot and flight commander with the 324th Fighter-Interceptor Squadron at Westover Air Force Base, Massachusetts. In July 1958, General Chapman was transferred with his unit to Morocco. He returned to the United States in June 1960 as a student in the Air Force Institute of Technology program and earned his master's degree at the University of Michigan. 1965, General Chapman was selected as an alternate White House fellow, the only Air Force officer selected for the program, which was beginning its first year. Later that year, General Chapman was assigned as a member of the U.S. Air Force Inspector General Team, Norton Air Force Base, California. The General transferred to the Republic of Vietnam in July 1968 as a plans officer for the Military Assistance Command Vietnam, Saigon. He later served as project officer for Igloo White at Headquarters 7th Air Force, Tan Son Nhut Air Base. In August 1969, General Chapman moved to Headquarters Pacific Air Forces, Hickam Air Force Base, Hawaii, as a chief of the Fighter-Operations Branch. His responsibilities included the interdiction campaign in Southeast Asia, anti-infiltration programs and staff surveillance of all fighter forces in Southeast Asia and Western Pacific. After completing the Air War College, as a distinguished graduate, General Chapman completed FB-111 combat crew training and was assigned as deputy commander for operations of the 380th Bombardment Wing at Plattsburgh Air Force Base, New York. He later served there as both vice wing commander and wing commander. In September 1974, General Chapman was named commander of the 42nd Bombardment Wing (B-52s) at Loring Air Force Base, Maine. He returned to Maxwell Air Force Base in December 1975 as commander of the Air Force Leadership and Management Development Center. Following that tour, the general became director of computer resources, Office of the Comptroller, Headquarters U.S. Air Force, Washington, D.C., in July 1978. General Chapman returned to the Gulf Coast in February 1980 as the vice commander of the Armament Division, Air Force Systems Command, Eglin Air Force Base. He retired from the Air Force in September 1982 and went on to found both Executive Dress, a local mens wear store, and B3H Corporation, a successful defense-contracting firm serving the Department of Defense in numerous locations and capacities. He was an active member of Destin's Immanuel Anglican Church. General Chapman succumbed unexpectedly to a massive stroke. He was preceded in death by his parents, Mr. and Mrs. James Winston Chapman of Russellville. He is survived by his wife, Helen; his sister, Charlotte Chapman; his son, Robert E. Chapman II; daughter-in-law, Jennifer Wilson Chapman; and two granddaughters, Chelsea and Shelby Chapman. Internment will be at Arlington National Cemetery. A memorial service will be conducted Saturday at 11 a.m. at First United Methodist Church of Shalimar. Donations in his name may be made to the Immanuel Anglican Church Building Fund, P.O. Drawer 5889, Destin, FL 32540; or to West Point Mule Riders Spirit Fund, in care of the Association of Graduates, 698 Mills Road, West Point, NY 10996-9990. Brigadier General Robert E. Chapman was vice commander of the Armament Division, Air Force Systems Command, Eglin Air Force Base, Florida. General Chapman was born in Russellville, Arkansas in 1932. He graduated from the U.S. Military Academy, West Point, New York, in 1954. The general earned a master's degree in electrical engineering from the University of Michigan in 1962 and completed an additional 19 hours toward his doctorate degree. He completed the Air Command and Staff College in 1965 and the Air War College in 1972, both located at Maxwell Air Force Base, Ala. The general is a 1978 graduate of the Carnegie-Mellon University program for executives. He completed pilot training and advanced flying school in January 1956. He then served as an F-86 pilot and flight commander with the 324th Fighter-Interceptor Squadron at Westover Air Force Base, Massachusetts. In July 1958 General Chapman went with the squadron to Morocco as an aircraft maintenance officer. In November 1958 he was selected as a member of the 316th Air Division's Tactical Evaluation Team at Rabat Sale, Morocco. He returned to the United States in June 1960 and was assigned at the University of Michigan as a student in the Air Force Institute of Technology program and earned his master's degree. From August 1962 to August 1964, General Chapman was assigned to the Air Proving Ground Center at Eglin Air Force Base. He served as a plans officer for aircraft and missile systems, specializing in electronic warfare and survivability of manned weapon systems. He then entered the Air Command and Staff College. In 1965 General Chapman was selected as an alternate White House fellow, the only Air Force officer selected for the program, which was beginning its first year. He was assigned as a member of the U.S. Air Force Inspector General Team, Norton Air Force Base, Calif., in July 1965. He specialized in weapon systems acquisition, and research and development. The general transferred to the Republic of Vietnam in July 1968 as a plans officer for the Military Assistance Command Vietnam, Saigon. He later served as project officer for Igloo White at Headquarters 7th Air Force, Tan Son Nhut Air Base. General Chapman moved to Headquarters Pacific Air Forces, Hickam Air Force Base, Hawaii, in August 1969 as chief of the Fighter-Operations Branch. His responsibilities included the interdiction campaign in Southeast Asia, anti-infiltration programs and staff surveillance of all fighter forces in Southeast Asia and Western Pacific. After completing the Air War College, as a distinguished graduate, General Chapman completed FB-111 combat crew training and was assigned as deputy commander for operations of the 380th Bombardment Wing at Plattsburgh Air Force Base, N.Y. He then served there as vice wing commander and later wing commander. In September 1974 General Chapman was named commander of the 42nd Bombardment Wing (B-52s) at Loring Air Force Base, Maine. He returned to Maxwell Air Force Base in December 1975 as commander of the Air Force Leadership and Management Development Center. The general become director of computer resources, Office of the Comptroller, Headquarters U.S. Air Force, Washington, D.C., in July 1978, and assumed his present duties in February 1980. His military decorations and awards include the Legion of Merit, Bronze Star Medal, Meritorious Service Medal and Air Force Commendation Medal. He was promoted to brigadier general May 1, 1978, with date of rank April 25, 1978.